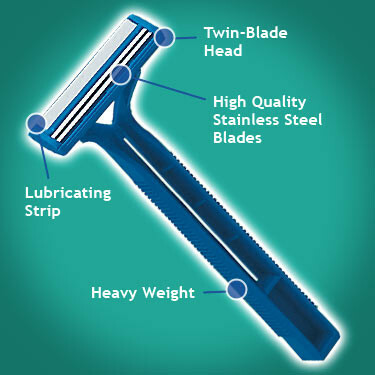 Buy Razor Blades for your Health Club or Spa facility that are inexpensive but quality one time use razors. Providing razor blades for clientele at high end spas, hotels, and health clubs is a standard service that should add to the pampering for your customers. The Razor Blade Company sells several different types of disposable razor blades for large-scale hospitality usage. Our blades are made from stainless steel featuring one, two, three, or four blades on a fixed or pivot head razor. All razors come with a safety cap and some razors are available in individually wrapped plastic pouches. Our razor blades are made using high quality steel that enables these single-use razors to shave nick-free every time. Our customers include Gyms and Health Clubs, Spas, as well as institutional use such as mental health or correctional facilities. The common factor among these facilities is the need for bulk purchases of single-use disposable razor blades. Spas and Athletic Clubs opt for our double blade, pivot head razor blade sold 1400 blades in a case. Correctional facilities favor more our inexpensive white single blade, fixed head razors. Some Correctional facilities have requested bright colored razor blades, so as to avoid disguising the shaver. We recommend our pink colored twin blade razors when these factors are a concern. For high end or multiple shave uses, try our individually wrapped MATRIX razors. Each razor has 3 blades, a pivot head, safety cap, and grip handle. When looking for razors for large hospitality uses, The Razor Blade Co. has an excellent selection of high quality disposable razor blades. For full selection or special packaging requests, call us at (310) 452-1034.